Title and abstract of NDC: Phi29 DNA-Packaging Motor for Nanomedicine. News Release: NIH selects Purdue to use phi29 DNA packaging motor for national nanomedicine development center. “Ingenious” biological machines, such as motors and membrane channels, inspire the development of biomimetic devices to enable specific cellular control for disease treatment and tissue repair. However, the development and control of a delivery device that can recognize specific targets for the active pumping of therapeutic DNA, RNA, or drugs into cells is challenging. We will bridge the knowledge gap at the bio and nanomaterials interface by constructing matrix- or lipid membrane-adapted motors employing the well-studied bacteriophage phi29 DNA packaging motor. Research expertise and unmatchable collaborative facilities for biology and nanotechnology research will reveal engineering principles underlying the physical motion, energy transduction and transmembrane transport capabilities of the embedded motor. 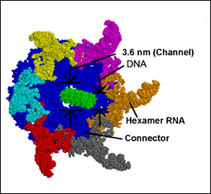 This matches the Vision of the NIH Roadmap for Medicine RFA, including “a system of molecular motors”, a model for the study of “energy transduction”, and a tool for “transport of materials across membranes”. The goal of our Nanomotor Drug Delivery Center is to construct a synthetic modified motor with artificial components for use in a variety of nanodevices and nanomedical applications. The center is to create liposomes and nano-structured arrays with embedded and active modified phi29 DNA-packaging motors for both passive and active transport of DNA and drugs. The phi29 pRNA motor is one of the strongest biomotors known to date. The motor is switchable, underscoring its highest efficiency in DNA insertion as compared to all other in vitro viral packaging motors, making it a viable option as a mechanical component in nanotechnology applications. The functionalization of the phi29 motor will be accomplished by focusing on three key areas of study: reverse engineering the phi29 motor; incorporating the active nanomotor into lipid bilayers for targeted drug delivery, and; developing active nanomotor arrays that enable innovative new diagnostics. The Center will develop hybrid systems that combine the best features of the biological nanomotor and synthetic delivery systems that have already achieved clinical acceptance but are still only blunt therapies for complex conditions such as cancer and infectious diseases. Incorporation of active phi29 nanomotors in liposomes will be a major thrust that will enable nanoscale control for therapeutic approaches. Initial efforts will focus on engineering specifications of the phi29 nanomotor toward the production of hybrid and synthetic nanomotors. Additional team efforts will exploit our understanding of the reengineered hybrid phi29 nanomotor specifications to create prototype nanomechanical devices for diagnostic applications, targeted delivery of therapeutics and for various nanomachines with applications in medicine. The engineering principles underlying the physical action, energy transduction and transmembrane transport capabilities of our matrix adapted motors will be elucidated by our interdisciplinary team, including physicists, chemists, engineers, mathematicians, and molecular biologists, at each step to further guide the use of the phi29 nanomotor in biomedical applications. It will be investigated through quantitative measurement of the modified motor (both in the lipid membrane-adapted and the nanostructured array form) combined with in silico modeling. This effort will provide understanding of the membrane incorporation, molecular transport characteristics, machine durability (operating limits, thermal, structural, and chemical properties and response to in vivo and harsh environments), and ion or electrical conductivity of the single pore. Investigation will be carried out on both the process of construction for each nanodevice and on device operation. More importantly, the study will reveal or determine bottom-up assembly principles – the favored approach in nanotechnology – for the construction of membrane integrated motors. Using this knowledge, the center will engineer nanodevices and systems of nanodevices, rather than construct them in an ad hoc fashion. Although extensive studies on the bacteriophage phi29 DNA packaging motor have been carried out for years, adaptation to a matrix substrate for therapeutic applications is unique and distinct. Our aim is to apply the knowledge of the phi29 motor to a membrane-adapted form, embedded in a lipid membrane sheet, lipid liposome, or template-directed environment. This novel approach could lead to a prototypical nanomedicine device for therapeutic or other nanomedical applications. Among the riskier aspects of the proposed Center are plans to make the chemically-modified and embedded motor functional in active DNA pumping or drug loading, and the extraction of quantitative force data from single molecule experiments of the new generation motor. As an important complement to the eight NDCs, our focus will be on an integrated biophysical chemistry and systems engineering approach to elucidate the many unknowns that still remain. Each NDC offers a distinctive opportunity for a dynamic exchange. Whole particle cryoTEM tomography and EM imaging of dynamic particles from the Chiu group will help us in characterizing various aspects of the dynamic and motional phi29 new generation motor. We can offer an additional test bed for the computational models of the Jakobsson group, while gaining insight on the production of nanoscale energy. The Lim group will benefit from the contribution of a “parts list” for engineering cellular control, and their rewired guidance systems in immune cells will help with our pRNA-based detection mechanisms for diagnosing & treating diseases. Force-generation of the phi29 motor for a cytoskeletal network probe can benefit the Sheetz group, while discussing ideas about intracellular single molecule imaging. An exchange of nanomachine information with the Bao group offers both the opportunity to learn more about nanomotor and nanopore mechanisms. Although we work at the molecular level, and the Ho group works at the cellular level, we share a common approach and can contribute to the common goal to re-engineer biological systems. Photoactivation capabilities from the Isacoff group can enhance phi29 motor-studded therapeutic liposomes, while the packaging motor may prove to be an ideal vehicle for delivery of their photoswitchable proteins. David H. Thompson, Professor of Chemistry, Purdue University. Rashid Bashir, Professor of Electrical and Computer Engineering, Purdue University. Carlo Montemagno, Professor of Mechanical and Aerospace Engineering, University of Cincinnati. Charles Buck, Bindley Bioscience Center, Purdue University. Anne Vonderheide, University of Cincinnati. Donald Bergstrom, Distinguished Professor, Nucleic Acid Chemistry, Purdue University. Jerzy Bernholc, Professor, Physics, North Carolina State University. R Holland Cheng, Professor, Cryo-EM, University of California Davis. Faqing Huang, Associate Professor, Nucleic Acid Chemistry, University of Southern Mississippi. Joseph Irudayaraj, Associate Professor, Optics and Spectrascopy, Purdue University. James Klaunig, Professor, Toxicology, Indiana University School of Medicine. James F. Leary, Professor, Nanomedicine, Purdue University. Chengde Mao, Assistant professor, DNA supramolecular chemistry, Purdue University. Sulma Mohammed, Associate Professor, Cancer Biology, Purdue University. Alfonso Mondragon, Professor, RNA X-Ray Crystallography, Northwestern University. Kinam Park, Professor, Biomedical Engineering and Pharmaceutics, Purdue University. Ken Ritchie, Assistant Professor, Single molecule Microscopy, Purdue University. Çağrı A. Savran, Assistant professor, Mechanical Engineering, Purdue University. Maria Spies, Assistant professor, Biochemistry, University of Illinois at Urbana-Champaign. Ganesh Subbarayan, Professor, Mechanical Engineering, Purdue University. Tuan Vo-Dinh, Professor and Director, Photonics, Duke University & Oak Ridge National Lab. Ji-Xin Cheng, Assistant Professor, Analytical and Physical Chemistry, Purdue University. William Cramer, Professor, Biophysics, Purdue University. Philip Low, Professor, Chemistry, Purdue University. J.Paul Robinson, Professor, Cytomics, Purdue University. Web site and all contents ?Copyright Peixuan Guo 2006, All rights reserved.